Mission: To financially support dental hygiene students who exhibit scholarship, leadership, compassion, ethical standards, and community service. The Dennis Muir Scholarship Award began in 1990 in honor of Dennis Muir, a longtime supporter of preventive oral healthcare and community volunteerism. During his long working career with Proctor & Gamble, and in his retirement, Dennis has been involved in community service. This scholarship has been established and primarily funded by donations and sales of license mats. 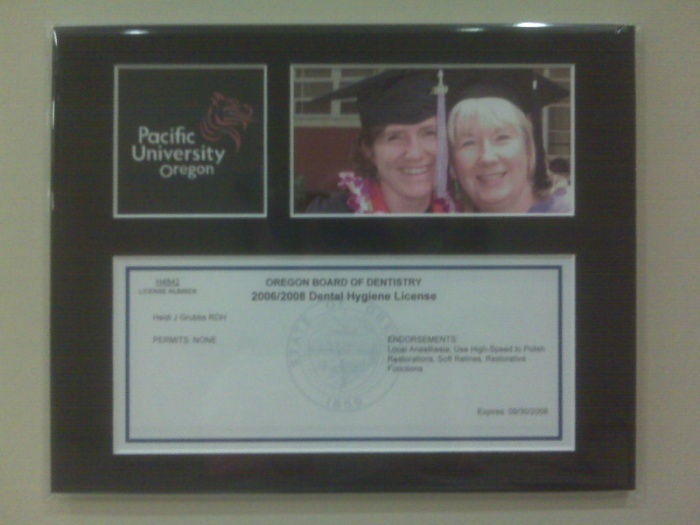 To be eligible for the Dennis Muir Scholarship, the applicant must be an Oregon resident, a first year dental hygiene student attending an Oregon program, and have at least a 3.0 GPA at the completion of the first term/semester of their dental hygiene program. Applicants are evaluated on their scholarship, leadership, compassion, ethical standards, community service, and communication skills. One Scholarship is presented each year at the ODHA Annual Meeting. The top applicant from each school not receiving the Dennis Muir Scholarship will be presented with an Award of Excellence. To obtain a Scholarship Application, please contact your dental hygiene school program director or advisor, or email [email protected] to make the request. This scholarship and Awards of Excellence are also partially funded by the sale of license mats (pictured below) and can be purchased at local conferences and/or via mail with the Mail Order Form. Customize your mat with photos, work, school, or favorite sports team logo. Templates for the majority of the local hygiene and dental schools have already been created and can be requested via email to [email protected].